Many of dogs participating in the Second Annual Brooklyn Bridge Pup Crawl this Saturday, April 16 will be sporting a very special leash. 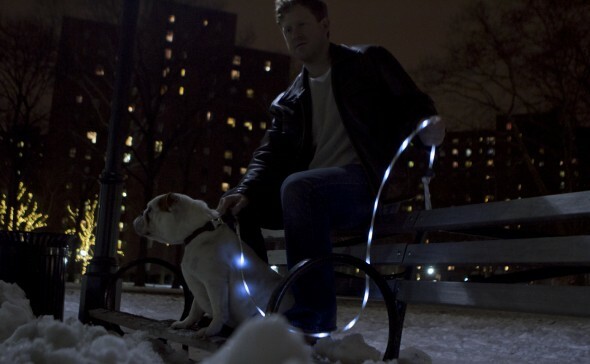 The Pup Crawl Lights-Up Leash™ is a glowing tether that enhances the visibility of pets and their owners during nighttime walks. Buddy is all over an orange leash, one to go with the t-shirt he and the Microdry team designed for participants in the Pup Crawl. An Important Note on Delivery: To support the mission of The Pup Crawl, all leash orders placed today will ship after The Pup Crawl event. We hope you will join us in lighting the night and spreading the word about pets in need. Thank you for your support! This entry was posted on Thursday, April 14th, 2011 at 11:36 AM. It is filed under Blog. You can follow any responses to this entry through the RSS 2.0 feed.